It's been a long time coming, but the day to celebrate the completion of the city's Town Center is upon us. On Saturday, April 27, the afternoon will be filled with fun activities, music, food and more as we revel in the culmination of years of planning, designing and constructing of our Town Center. 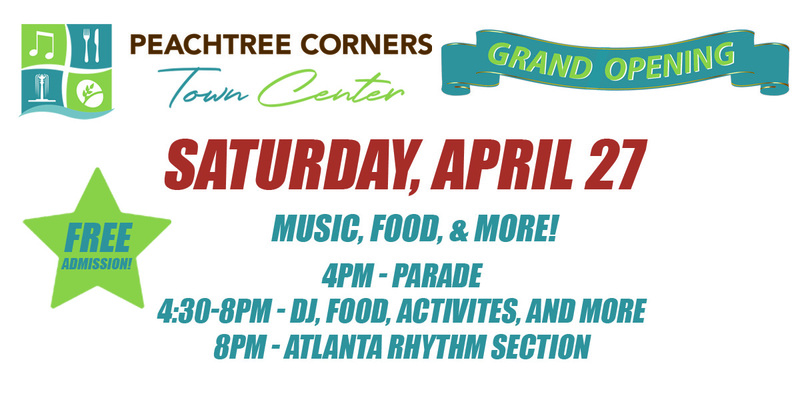 Join us for the Grand Opening of the all new Town Green at Town Center on Saturday, April 27th from 4pm - 9pm. Admission is FREE to enjoy the grand opening parade, DJ, strolling performers and a variety of food vendors. Fans can also visit one of the many restaurants located within the Town Center and bring food to the Town Green. The event finale is a concert featuring Atlanta Rhythm Section! With 15 albums of outstanding performances and songwriting to their name, the Atlanta Rhythm Section has been a staple on the Southern Rock scene for more than 50 years. With hits such as "So Into You," "Champagne Jam," "Imaginary Lover," "Homesick" and "Spooky" this show won't disappoint! Park in the parking areas off Davinci Court off Peachtree Corners Circle (3720 Davinci Ct, 3715 Davinci Ct or 2745 Davinci Ct). You'll cross Peachtree Corners Circle and access the Town Green via a path - look for the signs! Guests are expected to behave respectfully and in accordance with Town Green policy, state and local laws. Any guest that is acting in a manner that is deemed unsafe can be subject to eviction.